Europe will face another catastrophic gas shortage this winter if the EU and its member states do not act fast to resolve a gas price dispute between Russia and Ukraine. Unbeknownst to many, Russia stopped supplying gas to Ukrainian consumers this summer because of a payment dispute. While this is the latest in a long series of disagreements between Moscow and Kyiv on the terms of their gas trade, the political context this time around is more than obvious. In response to the ousting of the Moscow-friendly regime led by Viktor Yanukovych in early spring of this year, Russia cancelled the two gas price discounts it had agreed upon with Ukraine in April 2010 and December 2013 (Figure 1). 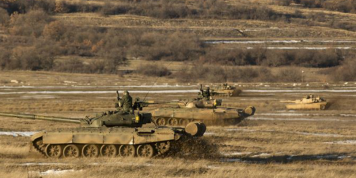 This has left Ukraine over $3 billion in debt to Russia. If the current dispute is not settled soon so that gas can again flow from Russia, Ukraine could be forced to tap into gas supplies destined for Europe to prevent its own citizens from freezing this winter. Figure 1: Russian Gas Prices for Ukraine. Source: author’s calculations based on data from the Statistics Service of Ukraine, the Ministry of Energy and Coal of Ukraine, and others. The Ukrainian gas storage system is the most important “element” in the security of gas supply for Ukraine and for the other European countries. An analysis of Ukraine’s monthly gas balance (Figure 2) shows not only that Ukraine’s domestic production is only enough to cover gas consumption during non-peak periods i.e. during summer (May-Aug), but also that the country’s gas consumption is extremely seasonal – its consumption during winter months is roughly four to five times higher than during summer months. Therefore, to meet peak demand, Ukraine has to buy gas from Russia during the spring and summer and store it to meet demand during winter. And still this is usually not enough to satisfy peak winter demand, which is usually met with even more Russian gas imports. This year Ukraine has not been receiving gas from Russia since mid-June, thus missing half of the gas stocking period that would have been used this coming winter. Thus Ukraine is likely looking at extreme shortages of gas when temperatures fall and will be faced with a choice of either letting its own citizens freeze or tapping into the transit pipeline and consuming Russian gas destined for other European consumers. In the 2006 and 2009 gas crises, Ukraine faced the same choice and decided to tap into the transit pipelines to stay warm. This triggered Russia’s to completely cutting off gas supplies to Europe through Ukraine, a short-term solution with heavy costs for the rest of Europe. Whether Europe will again face a gas crisis this winter depends on a few factors: (1) Ukraine’s ability to import gas from central Europe (the so-called reverse flows); (2) how much gas Ukraine has accumulated in its storage; (3) additional supplies from Russia as part of a possible interim deal mediated by the EU; and (4) Russia’s alternative pipelines to Europe that bypass Ukraine. 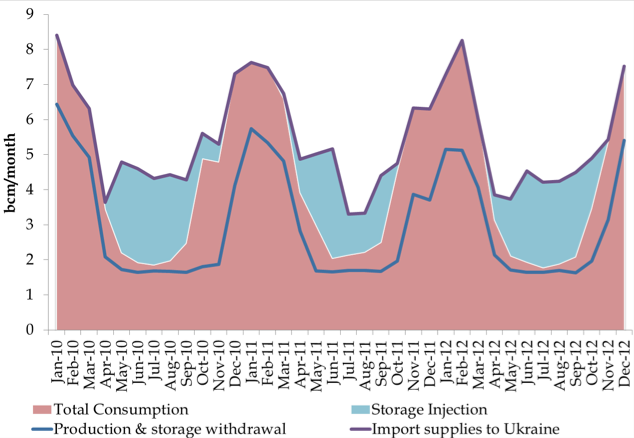 Figure 2: Ukraine’s Monthly Gas Balance: 2010-2012. Source: author’s calculations based on data from the Statistics Service of Ukraine, the Ministry of Energy and Coal of Ukraine, and others. After the disagreement with Russia over gas prices and discounts in April, Ukraine was able to import gas from both Poland and Hungary to round out its supply. However, even together with the Russian gas supplies accumulated before the disagreement, Ukraine’s gas imports were already 30-40 percent lower than in previous years. In addition, Ukraine and Slovakia have been working closely to open a physical interconnector with a capacity of 10 bcm/year, or 27 million cubic metres per day, to send gas from Central Europe to Ukraine. The pipeline has been operational since September and it is reported that at least 17-21 million cubic metres of gas per day is flowing from Slovakia to Ukraine. Ukraine has also secured a short-term deal with Norwegian’s Statoil to supply Norwegian gas through Slovakia to Ukraine, but, as if to balance the scales, Hungary has suspended its gas supplies to Ukraine, allegedly to meet its own higher gas demand. Thus a physical interconnector capacity from Europe to Ukraine does not guarantee that Central European countries will actually ship gas to Ukraine, it will depend on gas supply availability in the rest of Europe as well as the capacity of pipelines to ship gas from west to east. Therefore, even with aid of the Slovak-Ukraine interconnector, the maximum import capacity from Central Europe to Ukraine is somewhere between 11.4 and 14.9 bcm/year, which is three to four times less than Ukraine’s annual import needs, a truly troubling situation. While in the past Ukraine has filled up its storages to at least 20-25 bcm by mid- autumn, the mid-June cutoff has left it with stores of 16.7 bcm as of 6 October, which is 20-35 percent less than the usual October stock and at least 5 bcm short of what Ukrainian officials estimate is needed to sustain the coming winter. Supplies are lower this year, but so is demand. In 2013 consumption fell due to higher Russian gas prices and decreased industrial activity, intensified by the war in the east of Ukraine (where most of Ukraine’s industry (and also gas demand) is concentrated). 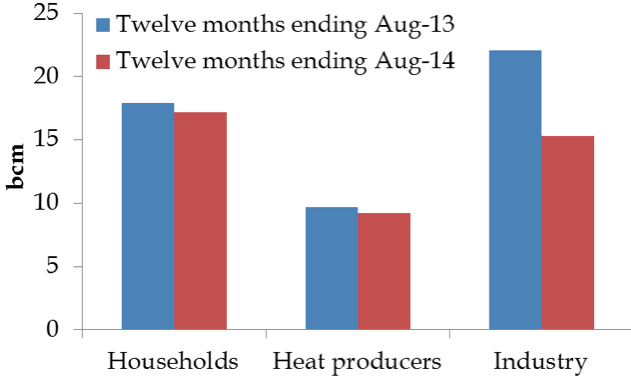 In general the upheaval in Ukraine has led to a16 percent fall in total gas consumption in the last 12 months, most of which is due to a 40 percent decrease in industrial gas consumption (Figure 3). Figure 3: Gas Consumption in Ukraine. Source: author’s calculations based on data from the Statistics Service of Ukraine, the Ministry of Energy and Coal of Ukraine, and others. Adding it up: Will Ukraine gas supplies fall short this winter? Even with the established reverse flow capacity from Europe, accumulated gas in Ukrainian gas storages, and reduced consumption in the industrial sector due economic collapse and war in the east, Ukraine might still face a severe gas shortage this coming winter, risking the security of supplies to all of Europe. Based on all this, without additional without additional gas imports from Russia, Ukrainian gas storage will be empty by end of January, causing severe gas shortage (see Figure 4). If Ukraine faces a cold winter (which is certainly not unusual) or if gas in storages only account for 10 bcm instead of 12 bcm due to higher required cushion-gas levels, then the shortage will come earlier and be even more severe. 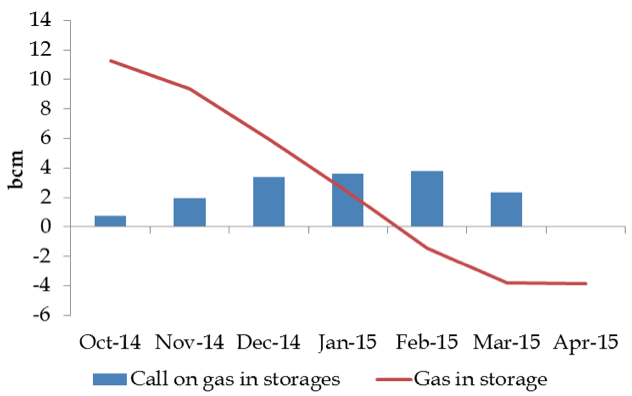 Figure 4: Demand for Gas from Ukrainian Storages. Source: author’s calculations based on data from the Statistics Service of Ukraine, the Ministry of Energy and Coal of Ukraine, and others. Even if industrial gas consumption were completely interrupted once the shortage becomes acute at the end of January, this would not solve the crisis, though it would probably bankrupt Ukraine’s economy completely. Interrupting households and heat producers in the coldest months of the year means freezing houses and offices, which is clearly a politically impossible situation for a Ukrainian leadership looking ahead to parliamentary and local elections. It would do great harm to the pro-Western government in Ukraine, perhaps even opening the door to the old regime as both industry and most households would likely vote in favour of anything that would return gas supplies and heat to their homes. It would thus be political suicide for Ukraine’s leadership to willingly forgo on gas passing through its pipelines on the way to Europe. It would thus be political suicide for Ukraine’s leadership to willingly forgo on gas passing through its pipelines on the way to Europe. 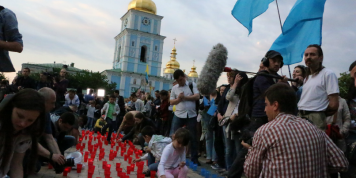 Bypassing Ukraine: can other pipelines meet EU demand? If we are right that Ukraine’s gas supplies will fall short, leading Kyiv to siphon from Europe’s supply in the pipeline, creating a crisis and a complete cut-off, where does this leave Europe? 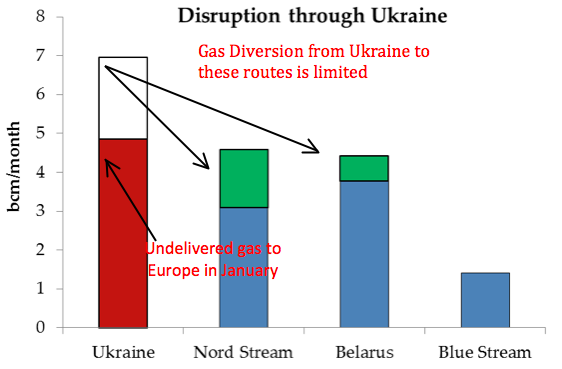 Based on gas flows for January 2014 (a rather mild winter month in Europe), existing pipelines from Russia to Europe that do not traverse Ukraine are not sufficient to compensate for a complete redirection of gas flows (Figure 5) or to secure sufficient delivery to the rest of Europe. Blue Stream pipeline, connecting Russia directly with Turkey, is at full capacity during the winter months, leaving only the Belarussian and Nord Stream. Supplies through these lines would not suffice, leaving Europe with a gas shortage close to 5 bcm or more if this winter is colder than the last. To put this in perspective, a shortage of 5 bcm is equal to one third of Poland’s total annual consumption and twice as much gas as Bulgaria uses in a year. The countries whose supplies are at most risk are Bulgaria, Hungary, Slovakia, Czech Republic, and Turkey. The Czech Republic and Slovakia would be able to avoid the crisis altogether if the Opal pipeline, which connects Nord Stream with the Czech transmission system, were allowed to run at full capacity. 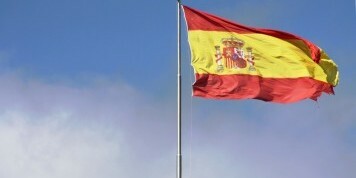 (Currently it runs only at 50 percent due to a capacity release programme imposed by the European Commission.) North-western European countries are well diversified and stocked, so the impact of a potential Ukrainian gas disruption would be minimal. Figure 5: Russian Alternative Pipelines are Not Sufficient to Avert the Potential Crisis. Source: author’s calculations based on data from IEA (http://www.iea.org/gtf/index.asp), and others. How likely is the interim deal between Russia and Ukraine to resume gas supplies for this winter? On 26 September negotiations over an interim gas deal between Russia and Ukraine to resume gas trade for the winter took place in Berlin, mediated by the EU. While no deal has been made thus far, the main parameters were outlined: Ukraine would pay its debt ($3.1 billion) for gas supplied in November and December of 2013, and April-June of 2014, in return for which Russia would supply at least 5 bcm to cover the Ukrainian gas demand for the winter, requiring payment in full upfront ($1.9 billion). This supply would come at a price of $385 per thousand cubic metres (tcm). While both Ukraine and Russia seem to have agreed on the price, the devil is in the details: Russia wants the price to be based on the pricing mechanism stipulated in the 2009 contract whereas Ukraine’s position is that the new price should be based on a new agreement, determined between Naftogaz and Gapzrom, and not between their respective governments. Both sides are likely to remain cautious in these negotiations, especially in light of the ongoing Stockholm arbitration between Naftogaz (who is trying to amend the price formula in the 2009 contract) and Gazprom (who is trying to defend its pricing policy and collect its debt from Ukraine). 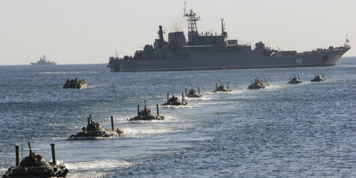 Consequently, whatever decision Russia and Ukraine reach on the interim deal could influence the Stockholm arbitral decisions. Given the potentially large impact on Gazprom’s revenue, it would be surprising if Gazprom agreed to a new pricing mechanism and a separate contract for this interim agreement with Ukraine, especially given its hard-handed actions during the 2009 crisis. And even if both parties come to an agreement to resume supplies under the pricing regime of the 2009 contract, which would help avoid the gas crisis for Ukraine (and Europe) this coming winter, the bilateral gas relationship between Russia and Ukraine is still not sustainable. The interim agreement between the two countries would only be valid until March 2015 and Ukraine needs gas from Russia to start filling up its storage as soon as April 2015. Thus even if acute crisis is averted in January, Europe will continue to run the high risks of a gas supply cut-off every winter until Ukraine gas policy is significantly reformed or Europe manages to secure its own gas supplies that circumvent Ukraine altogether. His policy brief “Why Europe Should Support Reform of the Ukrainian Gas Market” was this Monday and can be found here. (1) The gas storage level used for our calculations (12 bcm) is lower than the figure quoted by Naftogaz (16.7 bcm) because we understand that 5-7 bcm is considered cushion-gas and must stay in storages to maintain facility integrity and pressure.